Attendees visit a plantation near a wood processing company. 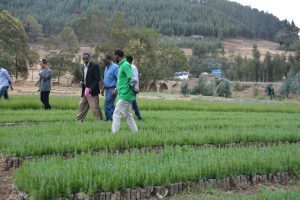 March 18 2017 – International Forest day was colourfully celebrated at Debre Birhan, Amhara Region, Ethiopia. The Ethiopian Government Environment’s Forest and Climate Change Ministry (MEFCC) and REDD+ organized an event attended by more than 300 people from a diverse range of international and national organisations: the FAO, UNDP, GIZ, Ethiopian Biodiversity Institute, the Oromia Forest and Wildlife Enterprise, Amhara Forest Enterprise, as well as individuals from the private sector. 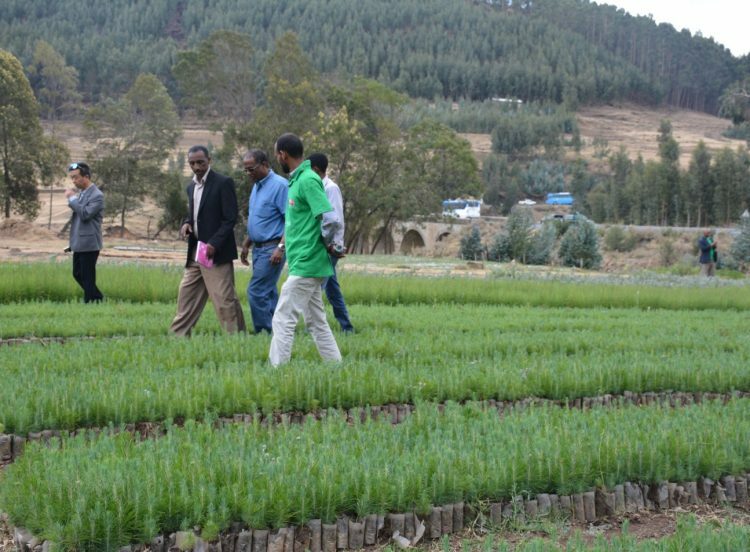 The event consisted of a field excursion to a wood processing company, established in 2013 as a joint investment between the Amhara Forest Enterprise and a Chinese investor. The wood factory currently produces plywood from eucalyptus wood. Visitors attended the factory and its nearby tree nursery and plantation site. The excursion was followed by a panel discussion, co-led by INBAR’s East Africa Director Dr. Fu Jinhe. The panel discussed current issues with raw timber supply in the region and the absence of hi-tech wood processing factories in the country. Dr. Fu made the case for using bamboo for industrial purposes in Ethiopia: a country which has over a million hectares of the plant, or around 30% of Africa’s bamboo resources. He discussed several of the products that can be made by processing bamboo, including panels, plywood, paper, charcoal briquettes and furniture. The excellent reception to Dr. Fu’s talk suggests good future developments for bamboo in Ethiopia, where its uses are currently limited to a small number of products. International Forests Day was also celebrated at INBAR HQ. 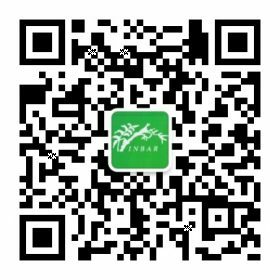 A statement on INBAR’s ongoing commitment to protect and strengthen forest services using bamboo and rattan can be read here.